Tuesday December 7th 1920 It was a nice day. The girls did a big washing. I put the clothes out and brought them in. I sewed a little Cora went to a dinner party at Whinerys. Hattie to town to a concert in the evening and I down to Otts. Thursday December 9th 1920 We were all late getting up this morning. Rob wanted to go to Cedar Rapids. Mrs & Mrs Sheldrick Cora and myself made the party. The roads were fairly good. We had a good dinner. Were in the stores some and got back about four oclock. I went up to the Hospital to see William. He was in a wheel chair. Hattie to town all afternoon and evening. I wrote to Joe Woolf and sister Ida. Friday December 10th 1920 A mild day. Hattie & Cora went to a luncheon at Mrs Cox. I was busy with my own affairs. I wrote Lydia in afternoon. Spent evening with Fannie. When I came home at ten oclock The Shedricks were here and the girls had an oyster supper ready. Two years today since I heard Dear Wills voice. 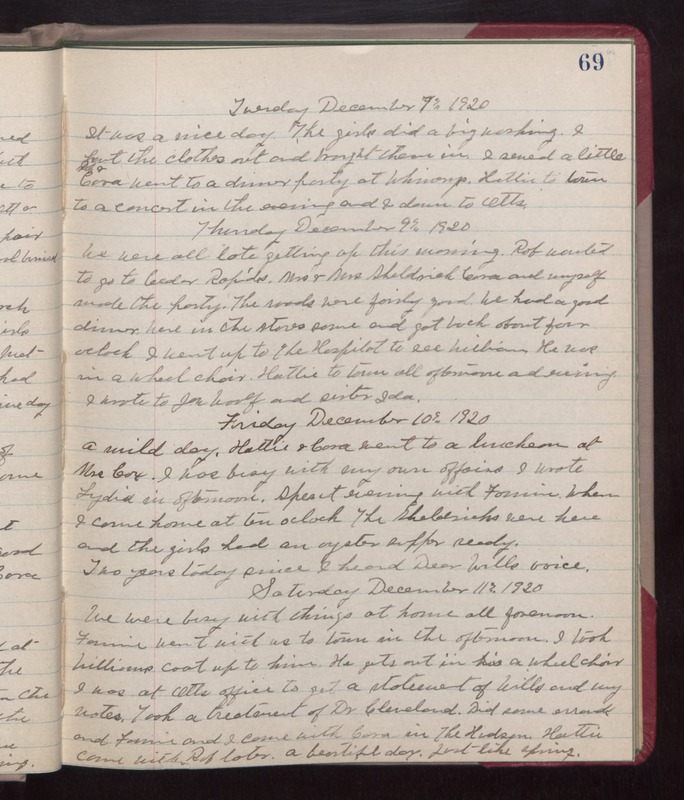 Saturday December 11th 1920 We were busy with things at home all forenoon. Fannie went with us to town in the afternoon. I took Williams coat up to him. He gets out in a wheel chair. I was at Otts office to get a statement of Wills and my notes. Took a treatment of Dr. Cleveland. Did some errands and Fannie and I came with Cora in The Hudson. Hattie came with Rob later. A beautiful day. just like spring.